In a recent article for the #JustJustice project, Darren Parker, a Ngunawal man and Phd candidate at Melbourne Law School, wrote about experiencing racism and violence within his family as a young boy. The article highlighted the importance of the social and cultural determinants of health in any discussion about the over-incarceration of Aboriginal and Torres Strait Islander people. In the detailed analysis below, he reflects upon his own journey into studying and critiquing the law, and asks: Is it possible to decolonise Australian law so that Aboriginal and Torres Strait Islander people can attain justice? Parker argues that over-representation of Aboriginal and Torres Strait Islander people in the justice system is a national crisis, requiring urgent leadership from all governments that is informed by Aboriginal and Torres Strait Islander peoples’ expertise. The two major professions I have pursued in my life (qualified chef and legal academic – and yes, I did it in that order, which seems ‘against trend’ nowadays) are linked back to my experiences growing up. It is only now, at this point in my life, that I am able to stand back and somewhat appreciate that view. But, if anyone is thinking that this is some type of “well you had to go through what you did to get to where you are….” treatise, you are incorrect. Let me make this absolutely clear, no person should ever experience or be subjected to the horrors of family violence. Ever. I have no idea whether I would have ended up where I am regardless of my family history, because that opportunity was taken from me due to family violence. However, what I can say is that whilst those horrific experiences were taking place, as mentioned previously, my Mother was a constant touchstone of strength. I don’t view her as a victim of family violence, but see her as she is: a powerful Ngunawal woman who commands self-respect, equitable treatment and self-education as cornerstones in her demands for the best of herself and others. The two professions I have pursued relate to, but are not a direct result of, the circumstances surrounding my experiences in family violence. As a child, helping Mum with the cooking provided me with somewhat of an escape. Later, formal commercial cookery provided something I was desperate for in my early teens and that was, to get away. On completing my apprenticeship I worked as a chef nationally and internationally, and it exposed me to the delights of foreign foods, peoples and cultures. It was particularly rewarding when meeting and working with other Indigenous people from around the globe because, apart from working in hospitality, we shared many commonalities regarding the ‘legal’ inequitable treatment of Indigenous people in our respective home nations. Our solidarity crystallised in many of these exchanges. Over the years and through meetings and discussions like this, my legal curiosity was tweaked more and more. I recall, however, the first time my interest in the law found its voice. It was during another violent assault by my father against all of us in the family. When the police were called during this particular rampage, they took so long to arrive that there was enough time for my father to methodically assault each of us again. I remember the attending officers casually walking towards the front door. When I voiced my disgust at their lack of urgency, I was pushed aside and told, “nobody is dead” – I was eight at the time. Then to watch the officers approach my father as if he was an old friend, and hear them being apologetic that they were even attending. Even more galling was watching them walk him out to the paddy wagon uncuffed and explaining to him how would be “out” in a matter of hours. The police didn’t ever appear to be concerned by my father’s return home after a few hours in the cells, more often without even being charged and usually even more enraged. Out of experiences like this, I developed a deep revulsion of the police. They never appeared to be in a rush to arrive, nor interested, whenever they were called to our place. We were known as “blacks” and it was “just a domestic”, both expressions I heard the attending police say on more than one occasion –an example of indirect institutional racism, as I was to understand later. But, it wasn’t just the actors within the legal system that were demonstrably lacking, it was the system itself, as Mum and I were to discover soon enough. When I was ten years old and my Mother divorced him, I started learning – experiencing – just how slanted the legal system was. As part of the divorce, the court imposed ‘alternate weekends’ on me to be spent with him (recognising that the Family Law Act 1975 (Cth) has changed regarding best interests of the child since then). I loathed the court and the legal system for forcing me into that situation, of being in his ‘care’ on alternate weekends. Wretchedly, it was my Mother who had to deal with the repercussions of those visits. As a child, it didn’t occur to me that the legal system’s set against a strong, decent hard-working Aboriginal mother as opposed to a white male violent-drunkard with a criminal history was an example of structural sexism. 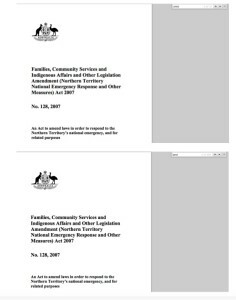 It would be quite some time before ss 60B(3); 60CC(6); and 61F of the Family Law Act 1975 (Cth) would be amended to incorporate legal regards for Aboriginal and Torres Strait Islander children. At the time, my mother lived in a state of hyper-vigilance. I won’t speak more on this because that is my Mother’s story to tell if she wishes. Experiences like these, among others, prompted me after 15 years as a chef to go back to school and study law. Yet, as I have told many people and students throughout the years, being born an Indigenous person in Australia makes you a legal and political person regardless – so my interest in these areas has always been there. However, before you think otherwise, I did not study law to wrestle in the heartache that is family law. Neither was it my desire to evangelise or prosecute within the criminal law. It was never my intention to study law for the pure sake of practising it – though I did for a time. No, I wanted to research it – I wanted to teach it. Moreover, I wanted to research and teach in public law, that is, the person vis-à-vis the State. The reason for my choice was straightforward; studying and also knowing about an unjust system did not allow me to be ad hoc or piecemeal in my approach to law. I wanted to examine, critique and evaluate the law’s supra-structure, particularly how the legal system itself, in many direct and indirect ways, is set against Aboriginal and Torres Strait Islander peoples in Australia. It is for these reasons I have chosen this course of study. Public law provides me with an enormous scope to peer into various areas of the law and reveal its deficiencies, as well as its myopia with regard to Aboriginal and Torres Strait Islander peoples. Public law also goes to the heart of the jurisprudence undergirding the Australian legal system and allows for the exploration, examination and critique of its Eurocentric legal philosophies and practices. The formative political and legal document of Australia – the Australian Constitution – is a document more predicated upon a marriage of the former colonies for trade and commerce purposes and for purposes of racial exclusion than it is as ‘a people’s constitution’. The Constitution was drafted at two conventions held in the 1890s, and neither convention included any women, nor any Indigenous representatives or ethnic communities. Each convention was solely stocked with white land-owning males. Without going into a drawn-out legal exegesis on the Constitution, its racist origins are well known. Suffice to say that the preamble sets out the history preceding enactment, and that enactment of the Constitution was supported by ‘the people’ of the colonies. The Constitution is silent on Indigenous peoples prior occupation. Whereas the operative provisions within the Constitution – at that time: ss 25; 51(xxvi); 127 – were based upon Aboriginal and Torres Strait Islander peoples’ exclusion and discrimination, as they were not considered citizens, thus not a part of ‘the people’, constitutionally. This was the legal foundation upon which Aboriginal people were part of the Commonwealth of Australia on 1 January 1901. Given that discrimination and exclusion were the foundations for Aboriginal and Torres Strait Islander peoples in the nation’s founding document, it is unsurprising that laws flowing from it are still tainted with much of its origins, as Australian law acts as an agent for colonisation. This is despite the best intentions of the 1967 referendum. 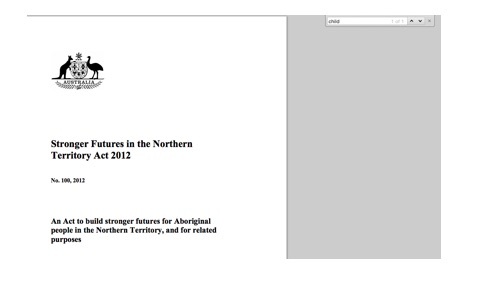 Laws in this country still discriminate against Aboriginal and Torres Strait Islander peoples. Therefore, the questions must be asked: Is it possible to decolonise Australian law so that Aboriginal and Torres Strait Islander people can attain justice? Without wrestling with the metaphysics of ‘what is justice?’ the following addresses the more immediate realities with regard to Aboriginal and Torres Strait Islander people’s contemporary treatment in the Australian legal system. Further, if it is possible to decolonise laws in Australia, what structures and processes are required to achieve such ends? 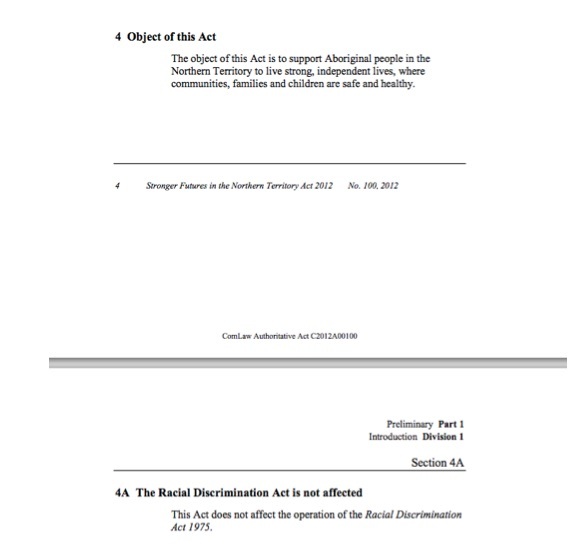 Unequivocally, discriminatory laws in Australia must be removed from current statutes and decolonising law needs to be understood as legislatively incorporating: listening and responding to Indigenous voices and knowledge; implementing culturally safe systems; and allowing for the retention of community control justice programs. In the sphere of Indigenous incarceration rates and over-representation in the justice system, it is aboutchanging the record. Importantly, discriminatory laws must not be understood as simply being laws encapsulating overt racism such as segregated missions, hospitals, swimming pools, cinemas or exclusion from town halls and other public buildings – all of which, and more, occurred in Australia. Discriminatory laws take on more multifarious forms than those laws that are obviously racially directed. That is, the Australian legal system discriminates both directly and indirectly against Aboriginal and Torres Strait Islander peoples, as outlined further below. Firstly, lets view some directly discriminatory laws. 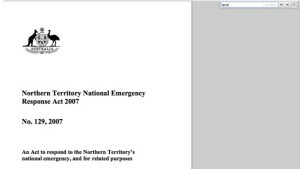 Below are some screen shots of both the Northern Territory Emergency Response, as well as theStronger Futures legislative packages that encapsulate the Northern Territory intervention. Both legislative packages, implemented by two different federal governments, were in response to the Little Children are Sacred report. Take particular note of the purpose of the Act here and reflect upon the screen shots above. 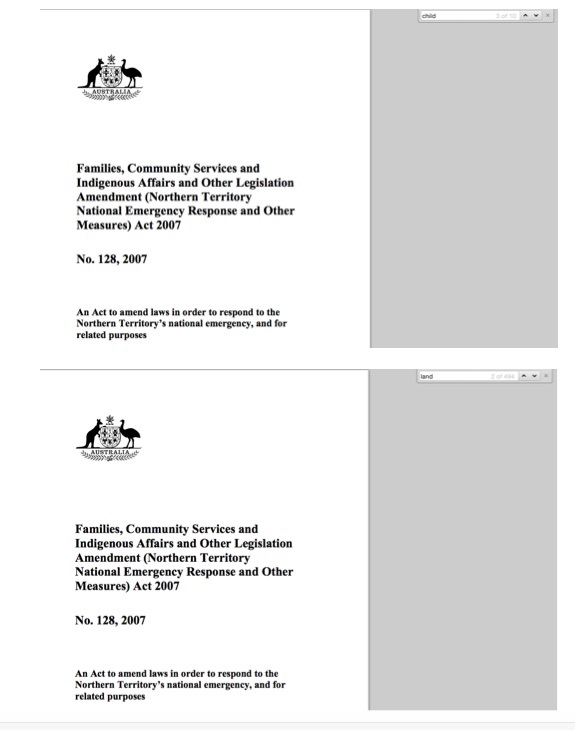 (The screenshots below show 10 mentions of ‘child’ were found in the legislation, and 494 of ‘land’). 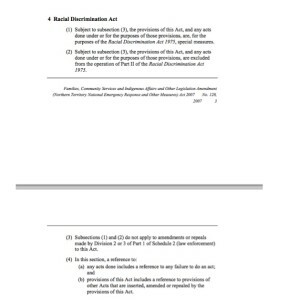 Note: The implementation as a ‘special measure’ and the suspension of the Racial Discrimination Act. 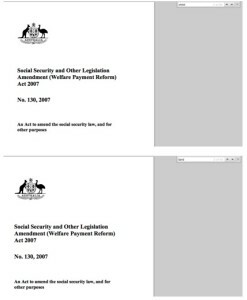 (Searches of the legislation below found 84 mentions of ‘child’ and 50 of ‘land’). Note: The intended purpose or ‘object’ of the ‘Stronger Futures’ package. The legislative effects of both of these packages are very telling. Moreover, it is easily viewed how each package is expressly directed towards Indigenous people. How both packages have been legally implemented has been in no small part due to the amended scope of the power contained within s51(xxvi). Particularly, whether the power allows for the federal government to implement laws that are detrimental to Indigenous people in Australia. 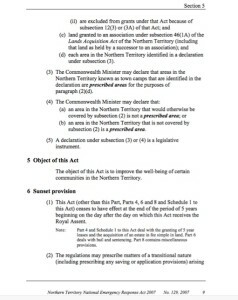 That is, due to the 1967 referendum removing the exclusion of Aboriginal people from s51(xxvi) and thus granting federal governments the power to legislate regarding Indigenous people. It was a matter of legal interpretation as to whether the power covered the implementation of laws that could be understood as detrimental. The High Court’s ruled in the Hindmarsh Island Bridge case, though the court was split 2:2:2 on the scope of the ‘race power’ (2 justices did not address the scope of the power) that the power granted under the ‘race power’ were plenary. Meaning, that government could implement laws either beneficial or detrimental under the power of s51(xxvi). 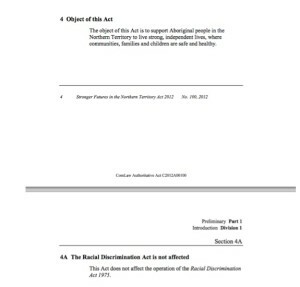 The legislative effect of the ruling has been that a federal government is able to implement racially discriminatory laws under s51(xxvi) through clear and unambiguous legislation – such as the packages above and the direct references to suspension of the Racial Discrimination Act. Of note, it was also stated by the High Court in the Hindmarsh Island Bridge case, that a law implemented under s51(xxvi) by its nature is discriminatory. 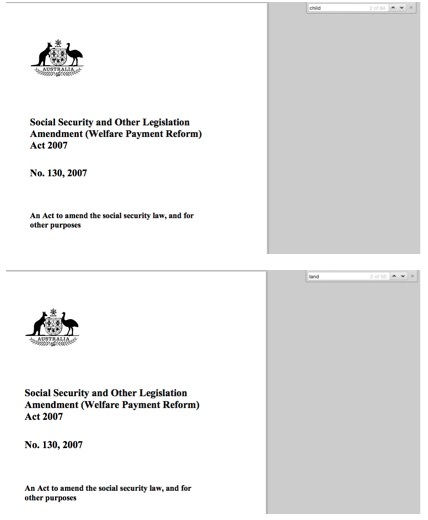 However, if a constitutional amendment were to be implemented to continue to make laws regarding Indigenous people, as suggested by the insertion ofs51A, such an amendment, if implemented, may provide that laws passed under such an amendment provide protection against discrimination based upon race. However, it may not provide protection for Indigenous people against laws passed under other parts of the Constitution such as the ‘territories power in s122. 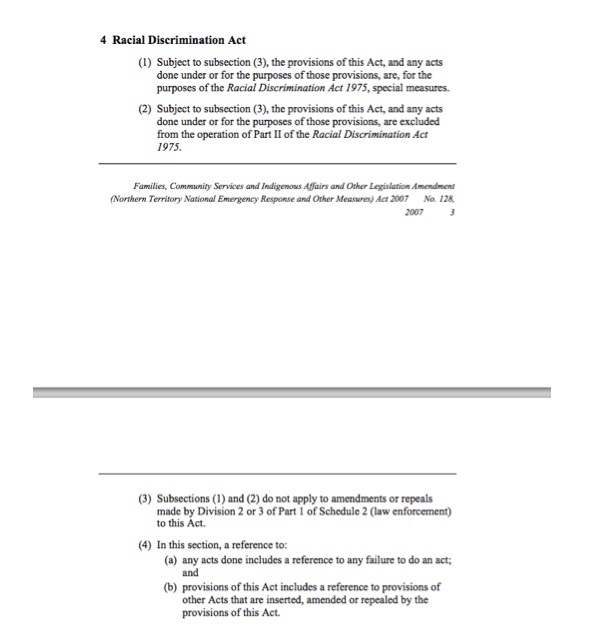 This means that without a general ban against racial discrimination, as suggested through the insertion of s116A, then discriminatory laws – such as the ones above – may still be passed through other parts of the Constitution, like s122. Nonetheless, whilst ameliorating directly discriminatory laws can largely be addressed in the manner suggest above, such implementation does not touch upon indirectly discriminatory laws. 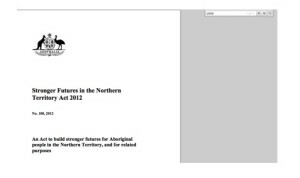 I now move onto examples of indirect discrimination in law against Aboriginal and Torres Strait Islander peoples. Again, I use a Northern Territory example initially, before then moving onto the States. 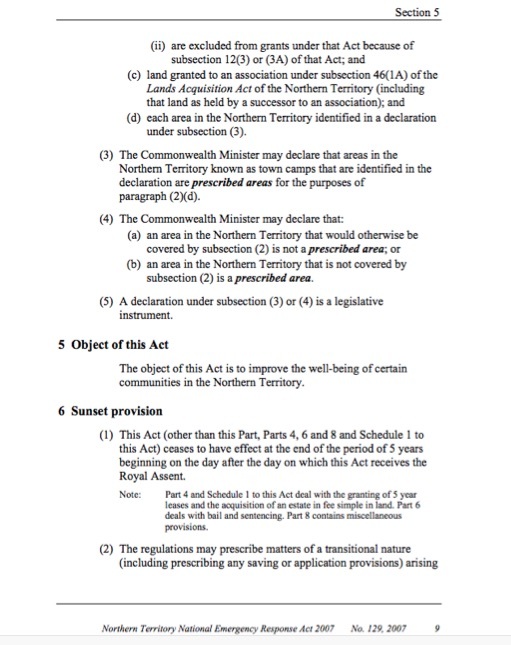 The recent enactment of legislation in the Northern Territory that allows for the paperless arrest of people committing minor offences and the mandatory alcohol treatment scheme have already had a disproportionate effect upon Indigenous people in the Territory. Wretchedly, it has already resulted in a death in custody and a death in care. Two people that are now gone from this earth due to indirect discriminatory laws and a lack of care that can only be classed as institutionalised violence. Both of these laws allow for people to be detained without a court process and without legal representation and as can be seen, with devastating results. It is possible that both have breach guaranteed common law rights. The paperless arrest laws are being challenged in the High Court the grounds for which are that the new laws lack judicial oversight and places too much power in the hands of police. The NT Coroner has recently called for the paperless arrest laws to be repealed, warning that they will result in more Aboriginal deaths in custody. Notwithstanding the laws’ constitutional validity, or otherwise, these laws can be repealed today without prolonged judicial deliberation. Both of these laws can be expunged from the statute books through the use of s122 of the Constitution. As mentioned above, s122 of the Constitution provides the Commonwealth with the power to override territory laws at any time. As the federal parliament did in 1997 when it passed the Euthanasia Laws Act 1997 (Cth)which made euthanasia illegal in the territory after a territory law allowed terminally ill patients to decide when to die. So, it is a matter of the political will that is lacking in not repealing both of these indirectly discriminatory territory laws. This situation is made all the more perverse by the well-known Royal Commission into Aboriginal Deaths in Custody (‘RCIADC’) and its 339 recommendations. A number of these expressly relate to the need for the decriminalisation of public-intoxication and most importantly, for arrest to be “the sanction of last resort in dealing with offenders”. It is abhorrent that both the imprisonment rates and Aboriginal and Torres Strait Islander deaths in custody have continued to rise, particularly, as the recommendations have remained largely unimplemented. Now to move onto the States where s122 has no effect. What there to reduce the ever-growing Indigenous incarceration and over-representation of Indigenous people in the justice system? Setting aside proposed constitutional amendments for the time, what is required is the implementation of justice targets at an integrated national level, as well as the introduction of statutory justice reinvestment. It is beyond doubt that State levels of incarceration of Aboriginal and Torres Strait Islander people have increased at alarming rates since the findings from the RCIADC were handed down. Equally beyond doubt is that the Federal and State governments are well aware of these repugnant statistics. Moreover, the need for justice targets aimed at ending the unacceptably high imprisonment rates of Indigenous Australians has also been discussed for years now. Yet, there is still no inclusion of justice reforms as a distinct building block in the Council of Australian Governments (‘COAG’) framework for the National Indigenous Reform Agreement (‘Closing the Gap’). This must be rectified immediately, otherwise the statistics will continue on their detestable upward trajectory. It has even been acknowledged that a coordinated whole-of-government approach is required to ameliorate the deleterious effects Aboriginal and Torres Strait Islander people suffer when in contact with the justice system. The over-representation of Aboriginal and Torres Strait Islander people in the justice system is a national crisis, requiring urgent leadership from all governments. And that leadership must be informed through Aboriginal and Torres Strait Islander people’s legal and cultural competencies. Furthermore, with positive initial trials recently being conducted into Indigenous youth justice reinvestment in NSW and South Australia, it is time for COAG to implement national justice targets and justice reinvestment plans. Doing so will undoubtedly reduce the current over-representation of Aboriginal and Torres Strait Islander people in the justice system. It will also allow for justice policies and practices to be informed by principles of self-determination and by the involvement and empowerment of Aboriginal and Torres Strait Islander people at all levels of the system. You can track the #JustJustice series here. 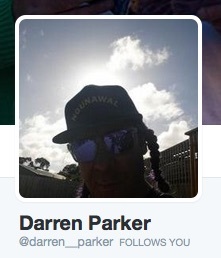 Croakey acknowledges and thanks all those who donated to support #JustJustice. We also thank and acknowledge our premium sponsors, the Jesuit Social Services, and Frank Meany of One Vision.